Remember the roasted tomatoes from here? Well, I used the same technique to put a sweeter, tangier spin on a classic Caprese Salad. You'll still find the traditional flavors from the fresh, peppery basil and salty, soft buffalo mozzarella, but the caramelization from the sugar and balsamic gives this Italian salad a boost and kick in the right direction! This plate is filling enough for a small lunch and/or works great as a side dish for any yummy Italian meal. Preheat the oven to 400 degrees. Place the tomato slices on a foiled lined baking sheet. Drizzle them with a little bit of olive oil and balsamic vinegar. Then sprinkle them with a pinch of kosher salt, pepper and sugar. The sugar helps them to caramelize. Put them in the oven for about 30 mins. Then let cool completely. 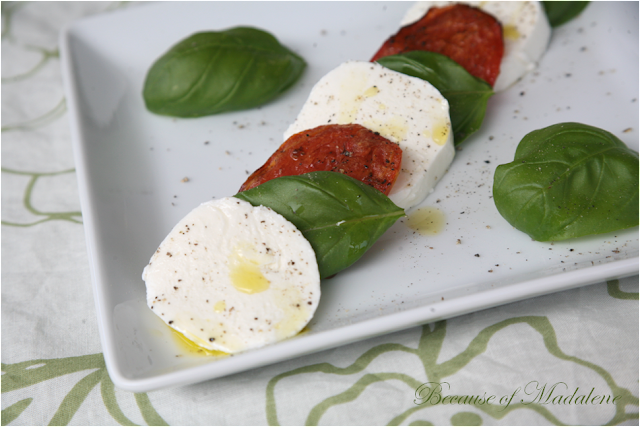 Arrange the mozzarella, tomatoes and basil on a plate. Drizzle another thin layer of olive oil and finish with a pinch of salt and some ground black pepper.